Yesterday, I was talking about going to Sam’s Club. Besides partaking of samples, and sidestepping the Girl Scout Cookie table, one of the reasons we go to Sam’s is to buy our meat in bulk. And then I divide everything up in meal size portions and freeze it. I like to buy a package of Flank Steaks. They come two to a package. When I get home, I make up the following marinade, and pour half into a freezer bag with one of the flank steaks, and the other half into another freezer bag with the remaining flank steak. Then I toss them both into the freezer. Well, toss is extreme. And potentially messy. When it’s time for an easy Flank Steak dinner, I thaw the bag, and the marinade has already done it’s magic. This is where I would ordinarily cook the steak outdoors on my grill. Yes, the same grill that was home to a wayward rat, and sneaky snake for a time. May they rest in peace. I made this steak for dinner a few weeks ago, but when I went to light up my grill. Nothing. I had to come with plan B in a hurry. I then heated up my Calphalon Grill pan, gave it a shot of cooking spray, and took the steak out of the marinade (reserving it) and grilled it on the stovetop approximately 9 minutes on each side. I covered the pan with a round lid that covered as much surface area as possible. Then, I took the steak off the grill and sliced it as thin as possible. It was still pink. (This is where brilliance stepped in. A rare occurrence, to be sure.) I deglazed the grill pan with a bit of red cooking wine, and added about 3/4 a cup of the marinade. I let that cook down for 3 minutes, and added a can of sliced mushrooms, and then the sliced Flank Steak. I cooked it, stirring constantly, until the pink was gone. This only takes a few minutes. The result? Excellence. Fiddledaddy use to refer to my Flank Steak as a chew toy, as it tended to overcook on the grill in my effort to avoid botulism. No more. It has the most wonderful flavor, and is now very tender. Chew toy. He’s just lucky that he’s fast enough to avoid the frying pan I would aim at his head. This marinade can easily be used for all types of meat. This makes enough marinade for two large steaks. * I substitute Braggs for all recipes requiring Soy Sauce. I find it in a large bottle at the health food store. Combine liquid ingredients. Pour over beef in plastic bag or baking dish. Marinade one hour or overnight. This is a great freezer recipe (prior to cooking beef). Remove beef from marinade and grill or broil. I have to admit that I only tried broiling this recipe once, and was nearly host to the fire department. Okay, if you want to add a recipe, put your name in Mr. Linky (with the name of your recipe in parenthesis), and in the next box, the link to your specific recipe post. In your post, link back here to Saturday Stirrings. I don’t think you can actually get botulism from steak… but my husband is afraid of pink meat too. (he grew up in Mexico without a refridgerator so he might have a reason.) I am always looking for ways to cook a well done piece of beef without choking someone. I’ll have to try this. We do that bulk meat thing with ground meat (from Costco which is similar to Sams). We divide it up into 1lb portions in sandwich bags. That steak sounds like something I could really go for! Mmmmm! You took the pink out? I need to go to Sams! Been meaning to get on the Saturday Stirrings bandwagon for the last couple weeks and finally did! 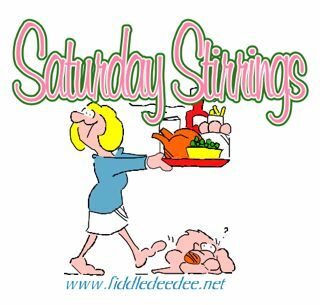 Off to figure out how to link back to Saturday Stirrings now…I’m blogger challenged. I’ll be trying that marinade. I’m doing your crockpot roast recipe tomorrow! Yum! How many servings do you get out of one flank steak? I’ve seen them in Sam’s, and considered them, but wondered if I’d need to cook one or two for our family of 6. Thoughts? The recipe sounds great though we seldom eat meat and couldn’t use several of the ingredients because of Rachel’s severe allergies. Howwever, I am so going to check out the Bragg’s Liquid Aminos. I have seen it at all the health food stores we frequent and always wondered about it. This looks like exactly the solution we need since we all LOVE soy sauce and Rachel and my husband can’t use it. Just a note to those who are wondering about Bragg’s Liquid Aminos. It is very similar tasting as soy sauce; it is still made of soy, but doesn’t have the wheat gluten that soy sauce has. So, if it is soy you are allergic too…sorry, you still can’t use liquid aminos. But, if it is gluten you are allergic too…get the liquid aminos and all those soy sauce filled recipes are yours again! That sounds luscious! I don’t like any pink in my beef either. Thanks alot, Dee Dee! I was going out of a grocery store today and saw the Girl Scouts with their table of cookies (and yes, I am a HUGE Thin Mints fan too! ), and couldn’t help but crack a smile as I thought of your post. As for meat, we like to buy half a cow with another family. A quarter of a cow lasts our family about 6 months, and it rounds out to about $2 a pound, including the filet mignon. Yummy! Sorry for taking up so many spots… 10, 11, 12, 13, 14….. new to this thing, and I wasn’t even sure what my url is. And link back to you….Good luck. Did I mention that I’m a teacher in a technology magnet school…. and they wonder what’s wrong with our educational system! Anyhoo, the marinating meat and freezing it is a nice idea. I think I’ll try it! Just found your blog, and I laughed out loud several times. Oh, try freezing the Thin Mints until July. There’s nothing better than laying in the sun eating frozen Thin Mints. To answer your question, this Flank Steak should feed a family of 6 easily. There are 4 of us Fiddles who dine on it, and there are always leftovers.